Michael Creed, TD, Minister for Agriculture, Food and the Marine performed the official opening of the new extension to the Westgate Foundation Daycare facility this morning. 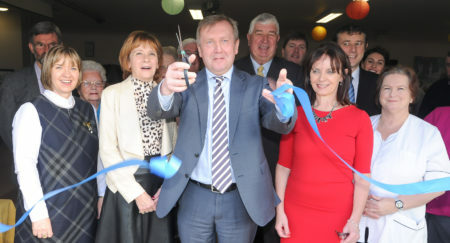 Michael Creed TD, Minister for Agriculture, Food and The Marine, cutting the ribbon at the official opening of the Westgate Foundation Daycare Centre building extension project, in Ballincollig, Co Cork, along with Cliona Hurley, deputy CEO of the Westgate Foundation, Norma Gayer, chairperson, Julie Murphy, CEO and Mary Donnelly, Daycare manager. Also included are local politicians and friends. The Daycare Extension is a quality improvement measure that has been designed to optimise the care and comfort offered to all clients. 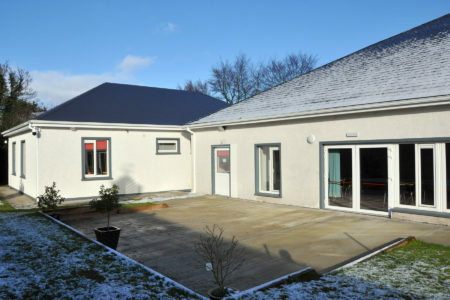 Westgate Daycare Centre forms part of an integrated range of community based services for older people provided by Westgate Foundation which also includes Sheltered Housing, Community Catering, Transport, Social and Active Retirement Club, Social Work and Counselling. This much needed extension has been designed and built to enhance the user experience at the centre, and in particular includes enhanced sanitary facilities; an activity room; staff changing facilities; kitchen area; an office and a storeroom. Delivery of the project was contingent on the financial support received by Westgate Foundation from the HSE, Department of Health, Cork County Council and the Hospital Saturday Fund for which we are most grateful. Westgate Foundation provides employment for up to 60 staff at any one time – 35 of whom are employed through the Community Employment Scheme, funded by the Department of Employment Affairs Social Protection. Daycare staff include carers, nurses, administrative staff together with support staffing in our transport and catering teams. Westgate Foundation continues to be focused on providing a holistic range of services for the older person by providing a range of social, educational and interactive activities that contribute to the continuing health and wellbeing of our users.